Directions: To apply for a learner permit or driver license you must complete an Application for Driver License (MV-44). You must pass a vision and written test and pay the application and license fees. The written test examines knowledge of the road signs, rules of the road, safe driving techniques and the laws about alcohol and drug use while driving. To pass the written test, you must correctly answer at least 14 of the 20 questions asked, but you must correctly answer two of the four questions about road signs. This test is intended to help you prepare for the types of questions you will be asked on the written test. The questions on the actual test may vary. Turning on your car radio. Stopping at regular intervals for a rest. Moving your eyes from side to side as you drive. To prevent drowsiness on long trips, you should schedule regular stops. Give yourself time to rest and stretch, even if you are not feeling tired. What might happen when alcohol is combined with another drug? The effects of the alcohol and the drug may both be increased. The effects of the alcohol and the drug may both be reduced. The effects of only the alcohol may be reduced. Consuming both alcohol and another drug may enhance the effects of both. For example, taking one drink when you are also using a cold remedy could affect you as if you have had several drinks. Make eye contact with and then pass the pedestrian. At an intersection where traffic is not controlled by traffic signal lights, drivers are required to yield the right-of-way to pedestrians within any crosswalk, marked or unmarked. Even if there is no crosswalk, yield to the pedestrian. 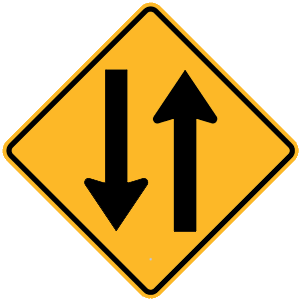 This sign warns of two-way traffic ahead. 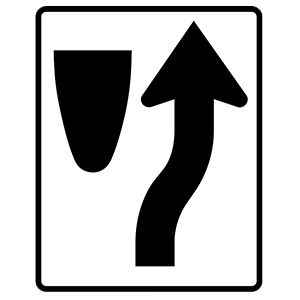 This sign indicates that you must keep to the right of the upcoming divider. Only if the other driver signals that it is safe. Whenever you have the opportunity to do so. In general, the left lane is used for passing. Only pass when it is safe and legal to do so. Which of the following signs is rectangular? Regulation signs are normally white rectangles with black lettering or symbols. These signs may give information about various kinds of special rules, including speed limits.